is not a gigantic tragedy." 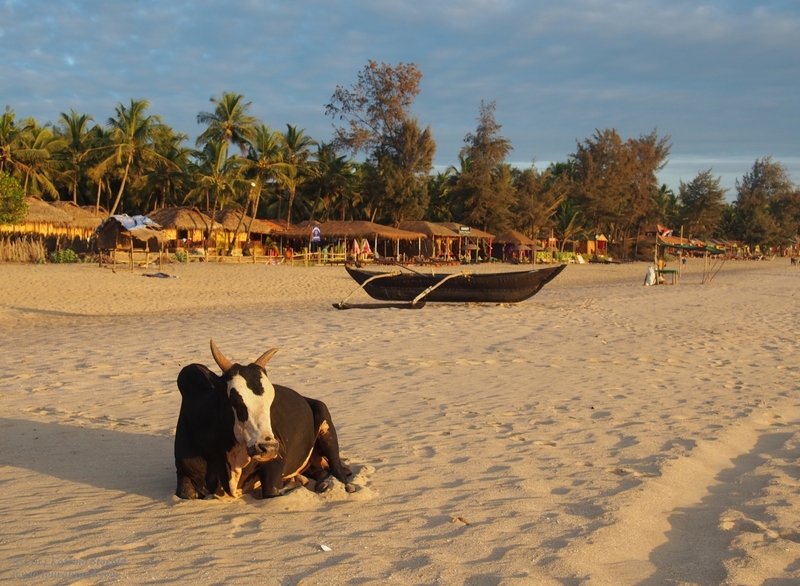 A bull at the magic hour on Agonda Beach, Goa, India. My last post reflected a lot of the uncertainty and fear I was feeling, which is a bit unusual for me. I tried to avoid letting the post turning into a pity party – after all, who feels sorry for someone stranded on a beach with great Indian food nearby? – and address some of the circumstances that led to the situation. Behind the scenes, I also asked for a bit of help from friends and family. They delivered. I believe the act of asking for help, and being willing to accept it, is a huge step in moving to a better place mentally and physically. It means that not only are you actively seeking outside assistance, which can manifest in a zillion little positive, uplifting ways, but you've let go some of what was holding you back and causing spiritual dissonance. (Yeah, I'm new agey like that.) As Obi Wan sagely stated, "You've taken your first step into a larger world." I had this idea that, despite my continual and repeated preference for slow travel, I'd need to hit at least 5 spots around the country to really feel like I'd done the trip right. It never really occurred to me to just stay put in one place. It seemed like a cop out: being a tourist rather than a cultural interpreter for my readers. I really DO like learning about history, culture, geology, religion/spirituality, food, wildlife, etc. etc. They are some of the underpinnings of my desire to and enjoyment of travel. However, faced with budgetary concerns and a complete and utter dissatisfaction with budget travel, I had to stop and rethink things. My mom offered my quite a lot of insight into how she'd dealt with upheavals, past and present, and what she'd learned from it. The opening quote from the post is but a small sample of the Mom Wisdom she shared with me. The abbreviated version may sound like a kick in the hiney, but the whole thing was quite gentle. Some friends in the travel community offered information and contacts for companies in India. 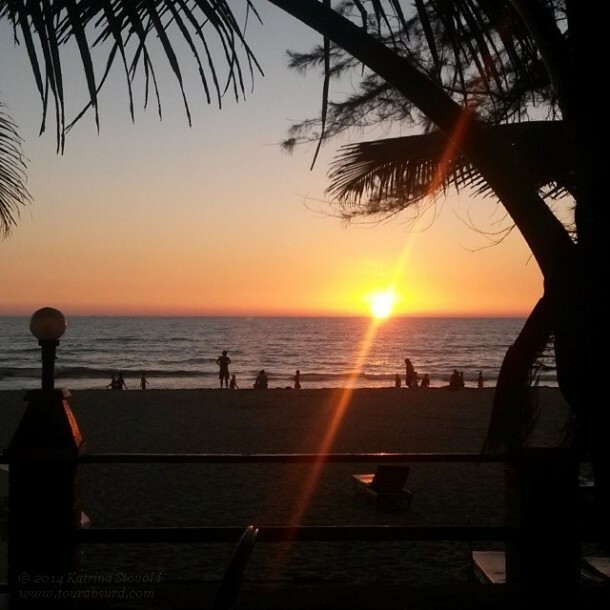 And serendipity – or evidence of how we create or own reality, your choice – introduced me to an American living in Goa who is good friends with the owner of a lovely resort in Kerala. Whee! 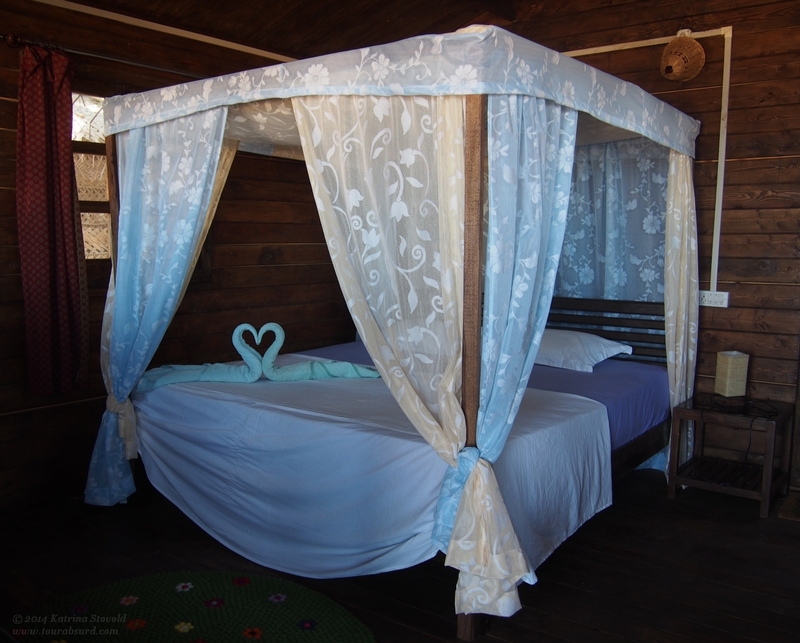 A magical bed in Agonda! One of the things I finally came to face to face with: luxury travel is where it's at for me. I'd been making an internal shift about this, slowly but certainly, for the last couple of years. Three of my best travel experiences to date have all been on the luxury side of the house: sailing and snorkeling around Zanzibar, sinking into the sumptuous pampering of the Cairo Marriott (a former palace – that should say a lot! ), and my recent stay at the White Horse Inn on the shores of the gorgeous Wolfgangsee in Austria. I love travel, alright, but even more I love comfortable, pampering, sumptuous travel. I've finally taken up reading – really reading, not just skimming – The Luxury Traveler's Handbook, by my friends Sarah and Terry Lee. It's helping me clarify several things about why I prefer comforts and perks over mere necessities. I'm also addressing a few personal issues around worthiness and expectation. These things all have an impact on how you see and interact with the world, so pulling them out of the cobwebbed shadows of the psyche into the light of day is a good thing. Out, spectral and imagined fears! I no longer have need of you. What I need instead is a good massage, huge fluffy towels, and a delicious dessert! Some of the funniest things that have happened to me – like locking a cow in an Irish castle – occurred regardless of the level of accommodation or circumstances. I always want to be able to laugh and giggle inappropriately at the hilarity of life, so there is no reason I cannot meld luxury and laughter together. Indeed, I feel it should happen more often! I decided to stop feeling irritated and depressed about being at a friendly, but dirty, hotel (hostel, really) with bad wifi, and to go on the hunt for better accommodation. I already knew one of the places I'd love to stay, a sweet little upscale operation here known as Simrose Resort, so I approached the owner to talk about travel writing. We had some back and forth emails, after which he invited me to stay for three days. I filled the gap until my check-in with a few days at a budget beach hut place with decent wifi. It was a small step up, but also provided some great contrast. Now even I'm better able to appreciate the niceties of my current spot having experienced the alternative. Sat down and watched this from my porch. Feeling much better about things now. So here I am, still at Agonda Beach. The staff at Simrose is cheerful, friendly, and respectful. The food is good, the view is amazing, and the sound of waves breaking on the beach will soothe me into gentle slumber. Paradise found. were shot with the Olympus EP-5 the nice folks at Olympus UK are lending me. I’m definitely with you, Katrina! I, too, love luxurious travel. I’ve definitely experienced travel at the other end of the spectrum for the sake of my research. but my heart sings, when I’m staying on a beach in a beautiful, clean, comfortable, and welcoming place with friendly and capable staff. Enjoy! We only live once. Agreed! As of right now, I’m finding that the biggest luxury is in staying home. I am SO loving waking up in my own bed, stumbling down to my own shower, and enjoying the heck out of my smokin’ fast internet connection. I think I’ve found the perfect spot for the moment!